Days after announcing new sustainability projects in the U.S. and China, Apple on Monday unveiled a new two-minute video highlighting the company's commitment to environmental responsibility. Entitled "Better Starts Here," the video begins with a list of chemicals and additives— BFRs, PCG, phthalate, beryllium, arsenic, lead, and mercury— that the company leaves out of its products, a list likely familiar to anyone who has watched an Apple keynote. Apple goes on to say that its smaller, more efficient devices use up to 59 percent less power now than they did in the past, though the scope of that timeline is not precisely defined. "We think about power, and how to power that power," the narrator says, segueing from products to Apple's rollout of renewable energy. "Because our ecosystem is part of a larger one." The video shows Apple's new 40-megawatt solar plant in Hongyuan, China, which the company says will provide enough energy to power all of its stores and offices throughout the country. It also calls out Apple's hydroelectric plant in Oregon and the recently-announced purchase of 35,000 acres of forest for sustainable packaging strategies. "We're learning more and more about new place where we can be better," the video concludes. "With renewable energy, hydropower, and forest preservation —new ways in which we can leave the world better than we found it." 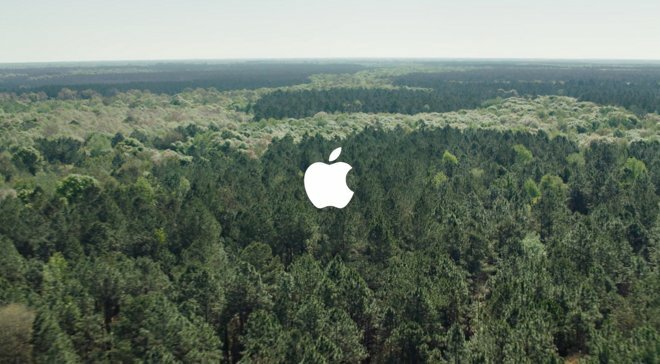 Apple began the "Better" environmental awareness campaign in April of last year, with a video narrated by company chief Tim Cook.